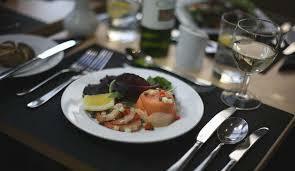 The Thames Showboat Dinner Cruise compliments a modern four course British Cuisine freshly cooked on board. Enjoy the stunning sights of London whilst relaxing to a resident live band preforming on the night. There is no other way to celebrate a special event with our fine food and extensive wine list. Boarding takes place from the Westminster Pier located opposite the Westminster Underground Station. Our unique Thames Showboat Dinner Cruise offers the best in spectacular views, taking you past the Houses of Parliament, under the major iconic bridges such as London Bridge & Tower Bridge heading towards the Docklands, Millennium Dome and finally to the Thames Flood Barrier. It’s the perfect way to see London with the comfort and panoramic views from the classic M.V Showboat Millennium boat, whilst enjoying a freshly prepared four course Silver Service Dinner. The company does not guarantee that products are free from nuts or traces of nuts. Gluten free meals are available with 24 hours' advance notice. Please note the vegetarian menu must be pre-ordered before the day of sailing. We are unable to take vegetarian menu orders on the night.